Obituary for Daniel Lee Nanninga | Throop Funeral Home, Inc.
Daniel Lee Nanninga, age 62, passed into God’s loving hands after a brief but tough battle with cancer. The son of Velma and the late Roger Nanninga, he was born on November 26, 1956. A lifelong resident of Coopersville, MI, he attended Lamont Christian School and then Coopersville Public Schools where he met his loving wife Kelly. They were married on March 25, 1978 and had 41 wonderful years together. He will be deeply missed by Kelly and by their children Kim (Joel) Vandyke, Kristen (Darren) Smith, and Karly (Dave) Makepeace, and by his beloved grandchildren, Wyatt, Brody, Jasper, Sloane, Jagger, and Sage, who adored him and called him Bumpa. Dan is also survived by sister, Diana Nanninga and brother Don (Sue) Nanninga, sisters-in-law Lauri (Don) Janose, Lesli Finkler, brother-in-law Gary Finkler, Teresa (Bruce) Jorgensen, Faith Goosen and many nieces and nephews. 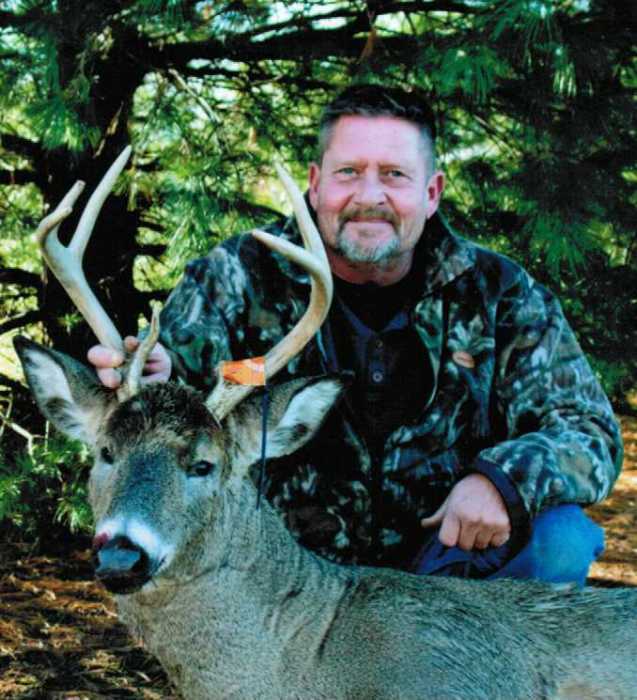 Dan was an avid deer hunter who loved hunting with his son-in-law Joel and grandsons Wyatt and Brody. He could often be found in his meticulous pole barn, where he spent countless hours washing vehicles, working on cars with his grandson Wyatt, and generally just hanging out with his son-in-laws, neighbors and grandchildren. He shared a love of dogs with his granddaughter Sloane and enjoyed watching Jasper and Jagger tearing through the yard on the power wheels trucks he bought them. He called Sagey “little girl” and liked spinning her in his chair to make her laugh. Dan tried to make it to all his grandchildren’s sporting events, most recently watching Brody play indoor soccer. He was so proud of his daughters and grandchildren. Dan began working as a drywaller at the age of 18 and in 1988 formed his own company D & D Drywall. He was an extremely hard worker, often starting his days around 4 am to begin working on prints and doing book work for his business, but also occasionally loved ending his day early to spend time with his wife Kelly. Dan loved having his family all over at their house, especially in the summer to enjoy their pool. He joyfully watched as his grandchildren played and learned to swim. He was known for his big, loud laugh that could even be heard by the neighbors. Dan was an amazing husband, dad, Bumpa, son, brother, uncle and friend and was loved by many. It’s hard to put into words how much he’ll be missed.